I've installed today the DC42, with a Buildtak black surface, but there are a few things that confuses me. What are those isolated green dots in the middle? The surface, as per the sensor, is a Switzerland mountain! how can that be posible? 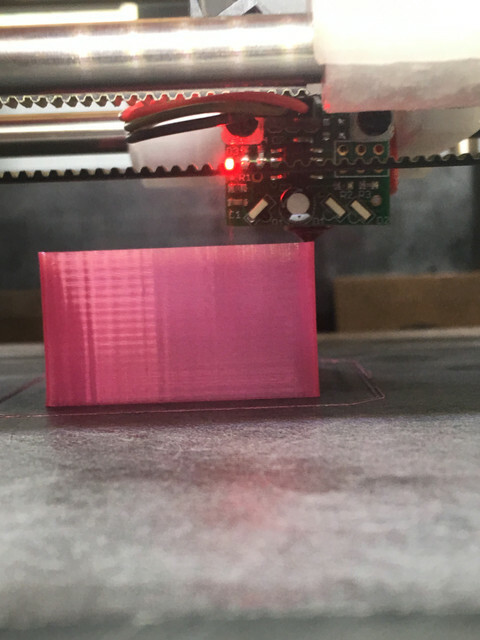 https://youtu.be/KlfR5Tt0xLE <- Here we can see the print of the first couple of layers, the sensor should be red over the part and over the bed, however, is only red over the part I'm printing… The material is White PLA that glows in the dark, BTW. Did someone used the IR Sensor with a Buildtak surface? 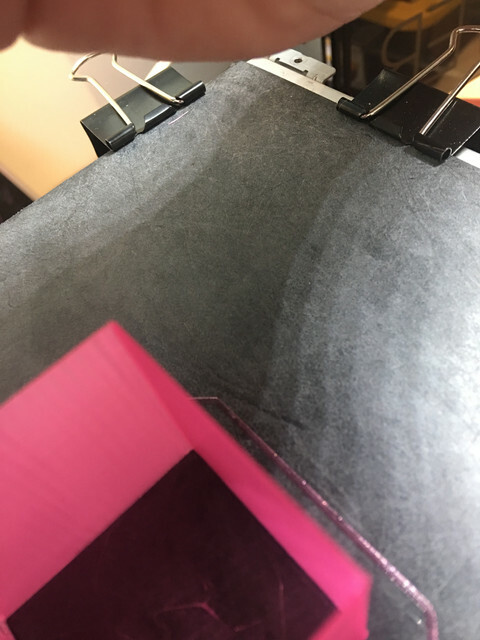 I'm having adhesion issues as the detection of the surface is not accurate enough, I saw when the first layer was being printed that the heigh of the layer was not equal, the perimeter closer to Y Axis was "taller" (so the nozzle was farther from the surface) than the opposite perimeter. Not sure if this can affect, but my printer is a Hypercube CoreXY, and I'm using LEDs illuminating from the top of the printer. I agree, that doesn't look right. Can you confirm that you are using P500 in your G31 command in config.g ? Yes, that's expected behaviour. Try measuring the trigger height at a few points, as descibed here https://duet3d.com/wiki/Using_mesh_bed_compensation#Checking_the_trigger_height. I'm still confused about the bed not being detected during the print, and the apparently random surface map I'm getting... I would expect that if the bed is not flat, if for example the back right screw is more tight, the map will show a flat inclined surface, with the lower side in that zone, but not like if the surface is a old road full of holes xD. When the nozzle is well below the trigger height, the sensor may fail to trigger because there is insufficient reflection into the sensor from the dark surface. So what you are seeing is not unusual. I know Fleks3d plates are the same, i do not have experience with Buildtak maybe the same or something similar can be done? Whitewolf do you have a good source of what sticks to PC at what bed temps? I saw some videos on Youtube about people sanding (by hand) the surface and cleaning it with alcohol in order to remove the remains of plastic from the surface… I may need to try it, although I'm a bit reluctant as I just installed the buildtak layer and is quite expensive to ruin it after just a few prints xD. So my old "expensive" build plate was Fleks3D…. it didnt work to well with the IR sensor because it is clear polycarbonate. So i oredered a sheet of 3mm black PC and wet sanded with vibrating sander after cutting 4 build plates out of the sheet with my miter saw. I use 0 degree bed temp on PLA so far with no sticking issues. I suspect PETG and others will be the same.... this stuff sticks way too good if not sanded well. Thanks, I shall get some to try. After reading about Whitewolf's plate I bought some PC from amazon and PETG had really good adhesion. Going to try ABS shortly. Whitewolf, are you using something like this, I guess? goo.gl/cXpKY3 (link to Amazon, not sure if it's ok, if not, just let me know and I will remove it). You need to sand it with 60 grit vibrating sander… keep it wet while you do for better results. If you dont sand it, it will be very difficult to get prints off. every now and the the surface starts to smooth out and parts dont just pop off. I sand it again when this happens. Do not use your bed heater with it, it is not needed and the surface will stay flatter if you dont. As you can see bed adhesion is really good on polycarbonate. I'm using the black on my Rostock Max with IR probe. I bought the same sheet he linked. I used 1400 grit paper on it. What you see is done by hand. Wanted to test before putting to much time into it. I'll go back over it with a small orbital sander to get a better final finish, but it's not needed. I actually found parts to stick too well especially if you find yourself needing to remove before the print is large enough to pop off. that is why i use the 60 grit. I can confirm ABS sticks no heat. Yeah, it stuck to the Flesk3d no problem… just wasnt sure without the fancy sand blasted surface good to hear cause this is a lot cheaper to have multiple plates on hand. I will be testing all of Taulman series as well as some Igus Iglur and Acetal POM filaments which are considered by many impossible to print.... we'll see I have a couple rolls sitting on my desk waiting for their turn on the printer.